Cari Dubiel is here today to report back from the Northeast Ohio Sisters in Crime event, Crimes of Fashion. Cari is also one of the hosts of the ABC Book Review Podcast. I highly recommend that you check it out. 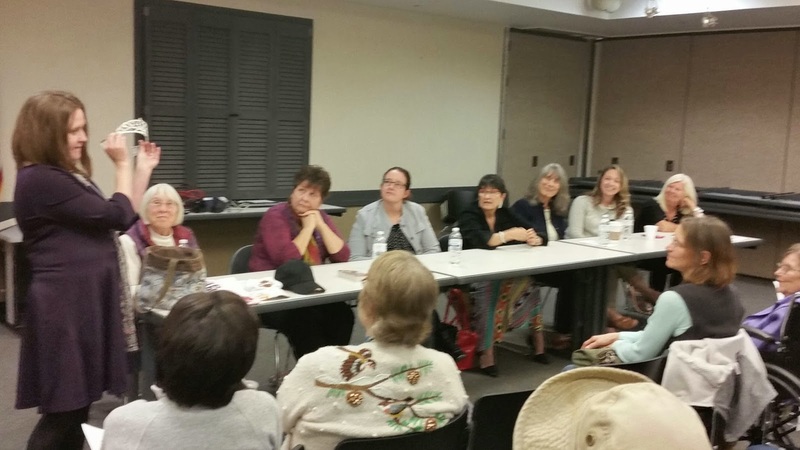 On Sunday, October 5, I plotted a library program: Crimes of Fashion. I orchestrated this event as a way to honor the organization I work for in my day job, and to benefit the authors I work with in Sisters in Crime. 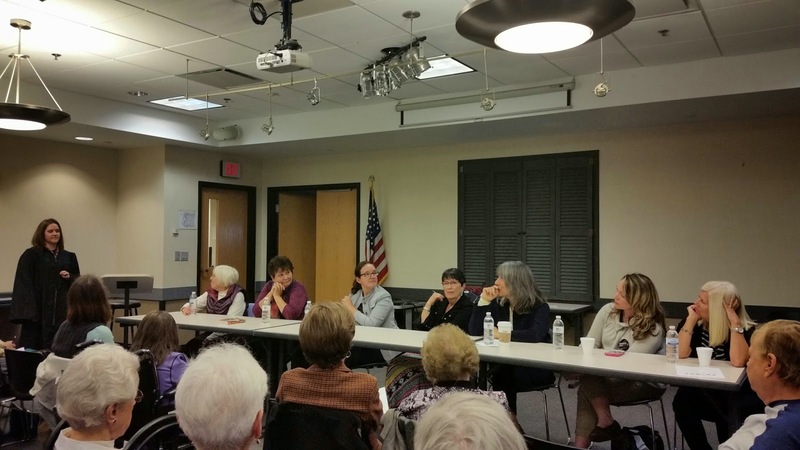 I’m active in the Northeast Ohio chapter in addition to my work on the National board as library liaison. And the Friends of the Twinsburg Public Library are celebrating their 20th anniversary this year. We started with an online panel. 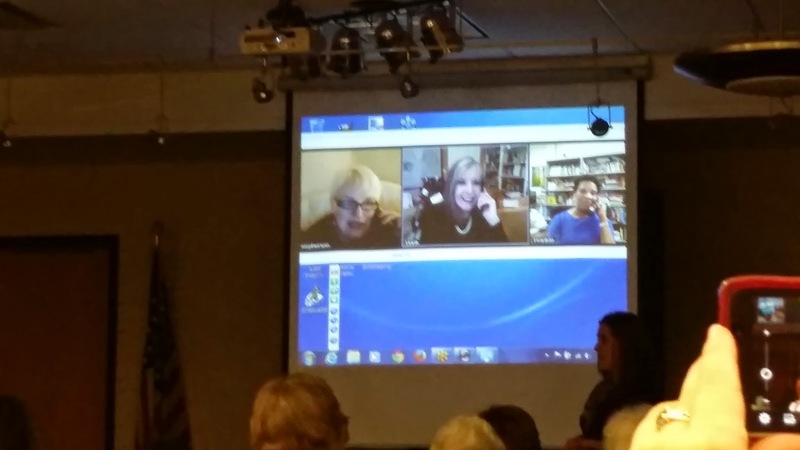 Frankie Y. Bailey, Catriona McPherson, and Hank Phillippi Ryan were game to work with the technology and call in from their various parts of the world. With their webcams on the big screen, Hank took “the ultimate selfie,” capturing her computer screen on her iPhone. When it works, technology can be amazing! All three are on the National board with me, and have signed books at booths for library conferences. We discussed how real-life research affects what characters wear (Frankie), method acting and point of view (Hank), and how different it is to write fashion for characters in the 1920s versus the present day (Catriona). Hank also told us a bit about her new book out this week, Truth Be Told. I was lucky enough to get an advance reader copy and I loved it. While I was sad to see Frankie, Hank, and Catriona sign off, I breathed a big sigh of relief when it was time to clear the computer away. I knew we weren’t going to lose the connection to our live, in-person authors. NEOSinC members Gloria Alden, Shelley Costa, Casey Daniels/Kylie Logan, Amanda Flower, Julie Anne Lindsey, Kathy Long, and Jane Ann Turzillo introduced themselves and their work to the audience and we played a game with fashion items. I asked the authors to tell me what various clothes say about a person, or how they could be used for a murder. When I pulled out my husband’s graduation gown, the authors mused that someone wearing a too-big gown could be trying to fit into a crowd but not doing a great job of it. A pink T-shirt could be a sign of standing out - perhaps as a way to establish an alibi? Several of our in person have books coming out: Julie Ann Lindsey's book is called Calypso, Kylie Logan's is called The Legend of Sleepy Harlow and Amanda Flower's is a children's book called Andi Under Pressure. I can't wait to read all of them. After the event, all our authors signed books, sold by The Learned Owl, an independent bookstore in Hudson, Ohio. 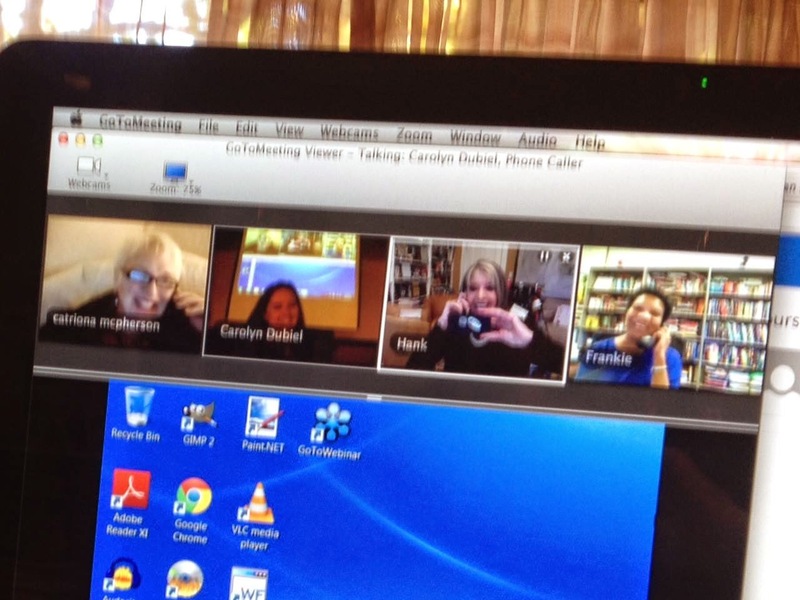 I told the attendees that if they wanted an autograph from our virtual authors, I would make it happen! Our celebration isn’t over yet. If you live in the Northeast Ohio area or are willing to drive, the Friends of the Twinsburg Library would love to see you at our capstone event. Luke Reichle, the costume designer from Castle and author of the book Secrets of the Red Carpet, will speak at the Hilton Garden Inn in Twinsburg on Saturday, November 1st. The event is from 11:30am-1:30pm and includes lunch. Tickets are $30 and can be purchased online at http://www.twinsburglibrary.org/friends. If you don't live in Ohio, come on back to Mystery Playground in November, where we will have a report from the Castle costuming event. Thanks for the information on the podcast. Will check it out.